1st: 4-1-5…Rapid Red (4) was picked up by the barn of Steven Asmussen (who reached a milestone at CD on Friday and may be loaded for another good day today). He does good with first outs off the claim and this one appears to be ready to win, again. Since the claim, Asmussen has gotten four good works in, including a bullet at Keeneland. Sitting on go. Audrey’s Double (1) gets the drop from trainer Neil Pessin, who is having a very solid meet. Picks up a positive rider change and gets a good mud mark. Corey Lanerie back aboard Greeleys Charm (5), who was an impressive winner last out for this rider. Takes another huge drop in class here, although he ran out of a condition that took six tries to pop in the last one. May be over-bet in this spot. I bet the 4 to win/place and key over/under the other two. 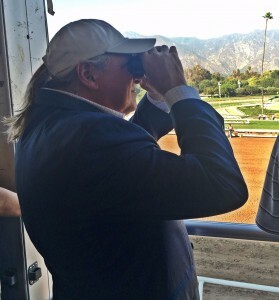 2nd: 3-1-6-2…Tarpy’s Surprise (3) ran huge as one of my selections in his last out, and he wheels right back in two weeks for trainer Dale Romans. Has a very nice mud mark and the 7YO is consistent on most days. Looks like the one to beat here, again. Paden (1) goes for hot connections and is coming off a nice allowance win here and gets the drop. This one picks up Lanerie and may go right to the front again from the rail. Has a win over an off track, as well. Morning Buzz (6) stretches out from 6F to 1M, but has two wins and two seconds at the distance and likes CD, too. Loses Lanerie, but picks up a regular stable rider. Bluegrass Beat (2) drops for a barn with only 17 starts this year, but this one does like the mud. I use. I bet the 3 to win/place and then box the 3-1-6 and the 3-1-2 in the exactas. 3rd: 1-2-7-6-3…Stageplay (1) heads up a really nice field for this one. This daughter of Curlin truly needed her race at Keeneland and this is a much lighter group than she is used to tackling. If fit enough, this one could catch the perfect stalking position from the rail and be salty. But the 7F chute can be tricky if she doesn’t break well. A worry. Mines and Magic (2) is another that will work from off the pace, but this one will drop off a bit farther. Comes out of two huge G1 events, where she was facing one of the best in the country right now. But she loves CD dirt, with 3 wins in 4 tries over the surface. Durango (7) gets a huge jock change and much needed class relief, after chasing Stellar Wind in her last. But this one turned up to be a really good event, too. Another stalker/closer type that will need a bit of luck. Sea Cloud (6) may be the controlling speed in this one, but loses Lanerie. Steps up here and will get a class test. Blip n’ Th Bye (3) ran a good one in her last, and has talent. But is she good enough to beat these? Ran second to Carina Mia in the 8 Belles here last May. That race may do it. I bet the 1 to win/place and key over/under the other numbers here. 4th: 4-2-3-6-5-1-7…Fish Trappe Road (4) is my play in this one, despite five tough beats in a row. Another solid field for this Allowance-Optional Claimer, but this one has the back class to step away if he can return to form. Money Flows (2) closed off a stalking position to just miss in his last and is a very solid mudder, if the track turns that way. Flashy Jewel (3) is the speed in this one and all of them must catch Lanerie on the lead. If he runs back to the races at Gulfstream, watch out. Gets a “dot” here, despite the third placing. Must use. Guest Suite (6) is likely to get bet a ton in this spot, what with coming out of several key KY Derby preps. But the 3YO is trying olders for the first time. It may be a bit early to do that, but still a good look here. Raagheb (5) has faced tough ones, too, but has run three seconds in 6 starts here. I bet the 4 to win/place and then key over and under the rest of my numbers. I cover with a 4-2-3 exacta box. 5th: 2-8-7-5-1-4…Northern Smile (2) travels south for the 5th running of the Keertana Stakes at 11/2 miles on the turf. This Maryland-bred is likely to get over-looked and is at 8-1 ML. But this trained has shipped here in the past and won stakes races. This may be another time. Ran a huge one off the layoff on a yielding grass course in her last. Watch out. Quiet Business (8) is the likely favorite and why not – won the G3 Bewitch Stakes at Keeneland at this distance in her last. Race looks to set up for her again today. Very good right now. The “dot” here goes to Giovanna Blues (7) for the “Mad Magician” – trainer Michael Dickinson. This cat can train, having won a Breeders’ Cup Turf Mile with a horse off a year layoff. This one won her last out off a layoff, too, and picks up Lanerie. Grey Stark (5) is a Tapit filly, who will be making her second start back off a layoff, too, and may make a sustained run from the back. Jockey is so ice cold that she is hard to use near the top of the ticket. I bet 2-8-7 exacta box and then key the 2 over/under the rest of the numbers. I bet the 2 and the 7 across the board. 6th: 8-4-3-10-9-1-7…I land on Ring Me Up (8) in this spot after a terrific try on the slop in her last. Any improvement off that one and she gets to move up and on after 3 seconds and a third in 5 lifetime starts. Gets Lanerie today. Bourgeois (4) ran against a horse named Actress in her career debut. That one broke her maiden in the G2 Black-Eyed Susan at Pimlico last Friday. Back on dirt today, Bourgeois has a huge shot. I love the breeding on Wholehearted (3) and she is not without a shot here, too, for a trainer that takes his time with younger ones. Now a 3YO, she may be ready to pop at a price. I bet the 8 over/under all the numbers listed and bet the 8 to win/place. If you get 8-1, as the ML suggests, then may be worth a little across the board on the 4. 7th: 4-8-5-3-2-1…Awestruck (4) gets the “dot” and the top billing here. I don’t normally bet horses who just break their maiden and move up in class, but this won ran off to a 7-length victory and looks the part – having run so well against Nonna Bella and Salty (the hot horse for the KY Oaks until she caught a muddy track and a horse named Abel Tasman). The likely favorite, but I bet with confidence here. Bet to win/place and key over/under all the rest. 8th: 8-4-12-5-10-7…An “all button” candidate here. Wide open race. Finally, and somewhat reluctantly, land on Remember the Alimo (8) for trainer Brad Cox. His “other one” in here, I’m with Miller (4), may be the one that gets the most action on the tote board, but the former worked better at Indiana than the latter. Front Row Debbie (12) has run some nice ones, but seems to hang when the real running begins. Have to use, though. Little Irishdancer (5) is another one for Dale Romans and gets class relief. I bet the 8-4-12 exacta box and then the 8-4-5 exacta box. A tad on 8 to win/place. 9th: 4-10-11-6-5-1-2…I go with Adore (4) for Asmussen here. This is the daughter of Big Brown’s second race off an extended layoff, and she may need one more to truly tighten down, but I loved her last race and she has the back class to whip these. Has trained super since that one, too. My pick here. Asmussen’s other one here, One True Kiss (10) may be the toughest competition. She is a closer of the two and may be a little more fit. Ran a good one here in the Dogwood Stakes last fall. Carve (6) may get over-bet or may just be good enough. I will take a conservative approach with her today. I bet 4-10-11 exacta box and then a 4-10-6 exacta box. I bet the 4 to win/place/show. 10th: 2-6-8-7…On paper, the 14th running of the G3 Winning Colors appears to be all but locked up by Finley’sluckycharm – who has won all four of her races at Churchill Downs and ran a huge second to Constellation in the G1 LaBrea Stakes at Santa Anita last December. She is the speed. She is the class. And, at 3-5 ML, she is the only horse in the race – according to some. But that’s why they race them on dirt, in this case, and not paper. I go for an upset with Ian Wilkes 5YO Mare Sweetgrass, who will be rolling from off the pace. Don’t know if she can get there at this distance, but she closed very nicely against some of the best mares in the country in her last – the G1 Humana Distaff. May be too tough an ask, but I am going to try. I’m boxing the 2-6 strong and then playing a win/place ticket on the 2. 11th: 7-9-5-4-3-1…Speedy A.P. gets a slight edge in the nightcap. Comes off a near miss in his last and the son of Lemon Drop Kid should wheel right back in top shape. May try to take them wire to wire in this one. Burntwood is 10-1 ML and has one of the coldest riders and trainers at the meet, but gets a huge drop in class and maybe both of the connections can get a Holiday treat today. Gladtobehere (3) is probably going to end up as the post-time favorite and you have to use. If he runs the same race as he did two back at Keeneland, he will be tough. I bet the 7 to win/place and then box the 7-9-5 and the 7-9-3. Notice the jump up by the 3 into the exacta box. 3rd/ G3 Daytona Stakes: Ambitious Brew (1) gets the nod, despite the horrible rail on the unique 61/2 F downhill course. So, simply put, he is the best, IMO. Stormy Liberal (6) is the ML favorite and gets the more lucrative post on the outside. Honor the Kitten (5) may be able to split the pair. I bet the 1 to win/place and then wheel over/under the other two. 4th / MSW: I love Honor & Courage (2) and have been waiting and watching for this one to run back. Most of the betting action may fall on Sonneterr (6). Despite being a maiden, this one has been on the KY Derby Trail all spring. Gets class relief for sure, but hits a Hollendorfer Special in this one. I bet the 2 to win/place and key over/under the rest of the field – hoping to hit a bomb. 5th / G1 Gamely Stakes: Going for a longshot here with Goodyearforroses (4) to upset Lady Eli (6), the 4-5 ML favorite. Avenge (1) is my other one here. I bet the 4 to win/place and wheel over and under the other two. 7th / G2 Monrovia Stakes: Another upset play for me here, as I go with Paquita Conqueta (7) and super rider Gary Stevens. Enola Gray (8) seems to be getting better with each start, and Illuminate (4) has to be the betting choice. I bet the 7 to win/place and then I wheel over/under the field – again. I bet the 7-8-4 exacta box as a saver.